In the first billion years of Earth's history, the planet was bombarded by primordial asteroids, while a faint sun provided much less heat. A Southwest Research Institute-led team posits that this tumultuous beginning may have ultimately fostered life on Earth, particularly in terms of sustaining liquid water. "The early impacts caused temporary, localized destruction and hostile conditions for life. But at the same time, they had a long-term beneficial effect in stabilizing surface temperatures and delivering key elements for life as we know it," said Dr. Simone Marchi, a senior research scientist at SwRI's Planetary Science Directorate in Boulder, Colo. He is the lead author of a paper, "Massive Impact-induced Release of Carbon and Sulfur Gases in the Early Earth's Atmosphere," recently published in the journal Earth and Planetary Science Letters. The paper addresses a major problem, one of the outstanding mysteries in the history of the solar system and Earth—the faint young sun paradox. "Atmospheric and surface conditions during the first billion years of Earth's history are poorly understood due to the scarcity of geological and geochemical evidence," said Marchi. However, ancient zircon crystals in sedimentary rocks provide evidence that our planet had liquid oceans, at least intermittently, during this earliest period. His team created a new model for impact-generated outgassing on the early Earth, showing how a resulting greenhouse effect could have counterbalanced the weak light from the infant sun enough to sustain liquid water. "Today Earth is in the 'Goldilocks zone,' where liquid water can exist on its surface," said Marchi. Referencing the fairy tale about the three little bears, the Goldilocks zone is an orbit around a star where it's not too hot, nor too cold, for liquid water. Liquid water is generally considered a key ingredient for life. When the sun was much fainter, the Earth with its present atmospheric composition would have been frozen solid. If the oceans were frozen, life may not have formed. The most straightforward explanation would be a massive atmospheric greenhouse effect, from either carbon dioxide or methane, or both. Previous work has speculated that volcanic outgassing or impact-vaporized materials could have released greenhouse gases. Marchi's team proposes a novel, more efficient mechanism. As the planet was pummeled by primordial asteroids—some larger than 100 kilometers in diameter—impacts would melt large volumes of rock, creating temporary lakes of lava. These pools of lava could have released large quantities of carbon dioxide to the atmosphere. "This early heavy bombardment could have been responsible for the large greenhouse effect needed to maintain warmer conditions, which may have been conducive to the early start for life on Earth," said Marchi. "The bombardment also delivered large quantities of sulfur, one of the most important elements for life." Well. Maybe. Such efforts to explain the beginning of life on earth only highlight earth's specialness – and perhaps uniqueness. Meanwhile, SETI continues to come up empty and NASA's search for evidence of any life – likewise. Bringing the anthropic principle down to earth? Truth is it is excessively strange that after some 14 billion years we are still alone in the Universe. It took us some 200 000 years to rise to civilisation level, nothing compared to the age of the Universe, yet we haven't bumped our heads onto another civilisation. A fair estimation considering that life spreads as much as possible would say that our neighborhood should be full of elements from other civilisations trampling upon us, and a good part of them should be non-biological. But that just doesn't happen. Sometimes the simplest explanations are the best ones. If the sun was a much larger star originally and went supernova it could explain most these mysteries. A supernova would most likely leave a lot of debris surrounding a newly formed neutron star with the lower mass elements expelled further than the heavier ones. That is what we see with the formation of the planets. It could also be a possible explanation as to why the sun's missing so much angular momentum. Great quantities of angular momentum could have been transferred to all the expelled matter during the supernova phase. Much of which would be missing entirely in our present day solar system. In the next phase neutrons in the newly formed star neutron star would start decaying creating hydrogen. When a great enough quantity decayed fusion would start again. Slowly at first but eventually the process would increase as the fusion process created neutrinos that decayed an ever increasing number of the remaining neutrons in its core. If one considers a neutron star with Sun's mass and a radius of 10 km, then a neutron at its surface has a gravitational binding energy of about -140 MeV. The fusion of hydrogen gives almost 27 MeV for a helium atom that is produced, i.e. about 6.7 MeV / nucleon. If the nucleon jumps at the maximum distance with that surplus energy, it arrives at about 10.5 km from the neutron star's center. But the Sun has a radius of about 700 000 km. So there seems not to be possible for the neutron star to increase to the size of the Sun. Maybe if the whole neutron star heats up due to H fusion its size will increase more than 10.5 km, but would it come to the size of the Sun? One could try to compute the whole binding energy of the neutron star and come with a final radius after the fusion energy is released, but it looks like being still around 10 km; 6.7 MeV is about 5% of the initial binding energy. Gigel, maybe I am not following you but I do not see where the gravitational binding energy would stop the neutrons from decaying. Once they decay the hydrogen plasma created would not have to have an escape velocity. You would have an ever increasing layer of hydrogen plasma until it was able to start the fusion process again. There are many solutions to the faint young Sun. This week there was a paper that shows how the initial magma ocean would degas all its CO2, while earlier models implied CO2 entrapment. problem solved. @orti: This paper tries to explain our early climate. That life existed at the time is coincidental to the geological problem. If you want to study emergence theories, those are humdrum re geological requirements. For example, vent theory has such examples on Mars and Enceladus [! ], and likely on pre-hothouse Venus. Quote Torbjorn: "@bill: ? Your "simple" answer is impossible: Sun is a main sequence star, as you would discover if you google it. [ https://en.wikipe...wiki/Sun ]"
I am aware that our sun is considered a main sequence star and I accept that. But that does not make it impossible that before it was a main sequence star it was much larger star that went supernova. If the Sun were a neutron star at one moment and hydrogen would start appearing there, hydrogen fusion would be initiated immediately because it would have far higher temperatures than at our Sun's center. Fusion would proceed quickly and burn up the whole of it in a short time. That's the way I see it at least. @bill: Well, it does make it impossible. - Astrophysicists are quite proficient in making main star sequence ,models which match observations. - On the other hand there isn't even a scenario where a neutrons star - or any other supernova remnant - can imitate that, so there isn't even an alternative model to consider. That is why I note that it is impossible as an 'answer', since there isn't an empirical answer in that chain of reasoning. Torbjorn, saying something is impossible does not make it impossible or claiming there is no model to explain it does not mean there is no model. It may mean it simply has not been discovered or created yet. A fact, free neutrons decay with a half-life of about 15 minutes. 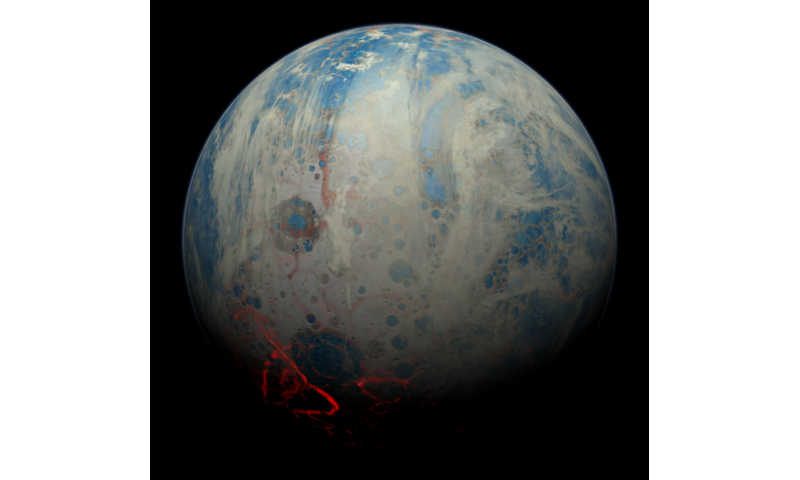 There would be other ways for the Earth to keep warm during its early life. Pherhaps it was closer to the Sun, and migrated outwards over the eons. Perhaps the atmosphere was thicker, providing more adiabatic warming at its base. There could have been a great deal more carbon dioxide or carbon monoxide making an earlier greenhouse effect. Perhaps greater cloud cover kept the surface warmer. Perhaps cloud composition and colour was different with more volcanic dust and carbon smoke. An ice coated ocean would provide some insulation to liquid water beneath, and would graduatlly get dark and dusty on its surface. @bill: If it is impossible according to current physics, it is. Until you replace it with something else, an unlikely (read: impossible) proposition. Proton decay is predicted by most GUTs, but so far has not been seen in any experiment. The current minimum half-life of protons is 1.67 x 10^34 years, based on analysis of the Super Kamiokande results last year. I can't even imagine what to say to someone so ignorant of astrophysics that they think the Sun could be a supernova remnant. @individualdefamingbillpress, please stop. Please note that I may choose to inform the real Dr. Press that you are defaming him on this site.